Summary QCA / Quantenna based AC2350 class router with Gigabit Ethernet ports and USB 3.0 and eSATA ports. 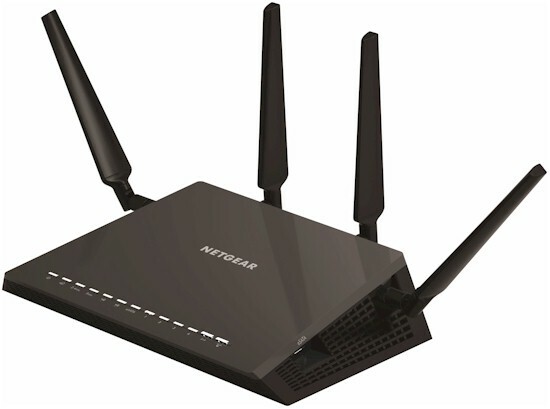 I'm a bit late to the party in reviewing NETGEAR's first 4x4 router, which was prematurely outed back in June by an overzealous NETGEAR partner in Taipei. Some of my foot-dragging is a (futile) attempt to slow down over-excited buyers and protect them from these not-quite-baked Quantenna-based products. But the larger reason was that my initial tests showed such unimpressive 5 GHz performance that I had to go back to NETGEAR and see if they had an explanation (they did). At any rate, my testing is done, so let's get on with it. The R7500 is a 4x4 802.11ac router based on a mix of Quantenna for the 5 GHz portion and Qualcomm Atheros (QCA) for the main CPU and 2.4 GHz. NETGEAR has more honestly classed the R7500 as AC2350 vs. ASUS' inflated AC2400 for its RT-AC87U/R. Marketing philosophies aside, both products offer the same maximum link rates, i.e. 1733 Mbps on the 5 GHz size, 600 Mbps in 2.4 GHz. Even though the R7500 is also a "wave 2" AC router like the ASUS, it also does not yet support Multi-User MIMO (MU-MIMO). NETGEAR said it will enable MU-MIMO at some point via firmware upgrade, but has no firm timeline. NETGEAR also has no plans to offer a 4x4 AC client. So if you want to see what a 1733 Mbps link rate really can buy you in usable throughput, you'll need to part with another $280 for a second R7500 or RT-AC87U/R. The photo below comparing the AC87 and R7500 seems to make the AC87 look smaller due to its smaller body size. Both routers are essentially the same width, so their footprints aren't that much different. The side-by-side comparison show below shows that when antennas are included in the footprint, the R7500 is only a tad deeper. The R7500's general styling has more in common with the original R7000 Nighthawk than the X6 R8000. Most indicators are white, with some using amber to indicate states other than normal or Gigabit Ethernet links. The LEDs are fairly bright, but can be extinquished via a back panel hardware switch. The top cover is solid, but all other surfaces are composed of open plastic grid for convection cooling since there is no fan. All Ethernet ports are Gigabit. There are two USB 3.0 ports on the left side and one eSATA port on the right. There are bi-directional mounting screw slots on the bottom panel so that you have the freedom to aim cables upward or downward when wall mounting.